College freshman are frequently asked the question "What are you going to major in?" Some are able to easily answer because they have known since they were in middle school. For others, the answer is not as easy because the choices are so great and the decision-making process may be a bit puzzling. Once you have thought about and answered these questions, begin to do some research. 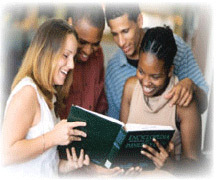 Review the college catalogs for courses outlines and descriptions. Talk with students who are taking courses and majoring in subjects that interest you- get an idea of what the curriculum is like from a student's perspective. Meet with college advisor and professors to get information about course work, expections (standard and implied), and suggested sequence of courses. Gather information about careers that interest you to find out the required courses and projection for employment in the future. Keep in mind that decisions made in your freshman year are not final. Many students select their major during the spring of their sophomore year. For those students who, as freshman, are uncertain about a major, this delay gives then almost two years of college experience and, often, a better sense of their interests and abilities. (Note: Some area of study, especially the sciences, may require students to start a sequence of cources in the freshman year in order to complete the major in four years). One more important thing to remember is that the choice of a major is yours.